Heather of One Love Photo hits me with this. I love how simple the image is. The bikes are just there (it's downtown Olympia, people ride bikes). Dustin and Jamie aren't hamming it up all over the place. They don't even seem aware of the camera. You hit the nail on the head with this candid-looking shot, perfect! What's next? 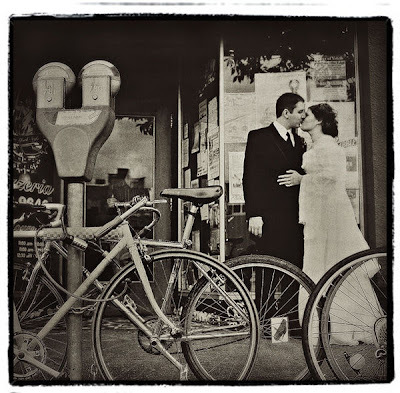 We're over bikes, balloons and cardigans over the wedding dress. Please help us forsee the next photo trend!! I haven't had the nerve to blog about my hatred for the SOCK SHOT. I mean WTF? You don't let him pick his own tie, and then you make him wear pink socks? That will teach him to hate getting married. Meg, I have to agree since somehow I was forced into this situation. I didn't really have a say in it, then all of a sudden we have pictures with these dumb socks. Oh well. I still really like this pic, I wish I had better ones from my wedding. My Guy is from Olympia ... he says the pizza place where they took these photos is awesome. Complete with a glass table with a pac man video game underneath it. I Love the comments and Yes,I feel so the same about all the trends. The bikes and balloons and socks. For the record I was taking photos of feet ten years ago! Am so very sad it's trendy now because I love a little footsie action. boo-hoo. Another photographer I know doesn't look at wedding magazines or blogs... so he isn't influenced by the trends and what's "in". Am thinking thinking that is pretty smart, but I can't help myself! he, he! With cool blogs like this, who can stay away! !Thanks for the mention!